Health and nutrition has been a growing niche for most domestic food and beverage companies. From PepsiCo to Nestle, Dabur, Patanjali, Britannia, Coca-Cola, Tata Global Beverages (TGB) and GSK Consumer, among others, a rising number are riding the wave with products targeted at the health-conscious. And, by recent announcements, most companies are moving to the next level in this drive. The accent is on cutting sodium and sugar levels aggressively and fortifying products with nutrients, as consumers make a switch to healthier products. 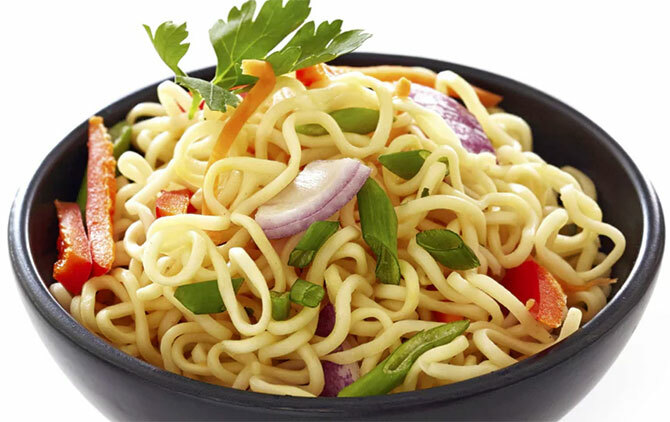 On Tuesday, Nestle India announced it was launching an iron-fortified variant of instant noodle brand Maggi, the first time the company was doing something like this. More such products are the offing, said Suresh Narayanan, chairman and managing director, indicating this was part of the company's 'Simply Good' agenda. "With 'Simply Good', we are building a better and stronger Maggi, driven by our purpose to enhance the quality of life (of consumers)," he said. According to the company, 'Simply Good' aims to bring down the sodium level in its products to 10 per cent by 2020, instead packing it with essential nutrients and ingredients. Narayanan says the sodium level in Maggi has been brought down by nearly a third in recent years. The product was recalled and banned by the Food Safety & Standards Authority of India two years ago on charges of containing lead and mono-sodium glutamate (commonly called ajinomoto) beyond the prescribed limit. Nestle is not the only company working to improve the nutrient value of its products. TGB, PepsiCo and Coca-Cola are all launching low-sugar and nutrient-fortified products in their drive to lure health-conscious consumers. TGB has just launched a vitamin-B6-and-C-fortified ready-to-drink beverage called Fruski in North India. Ajoy Misra, managing director, says it is positioned as a refreshing drink, low on sugar. "We wanted a product that is both indulgent and healthy. Fruski marries the two. This product is different from Tata Gluco Plus from our joint venture company NourishCo, which is an energy booster," he says. The company has also forayed into ayurvedic teas recently. These pack ingredients such as brahmi, tulsi, amla and ashwagandha, known to improve the general wellbeing of those who consume it. Misra says the company is working on a series of such products that not only ride the health platform but are also 'fun to consume'. The Indian units of PepsiCo and Coca-Cola are working on less-fizzy and low-sugar products, in line with global directives. Last October, PepsiCo's global chairperson and chief executive officer, Indra Nooyi, had unveiled Version-2 of her 'Performance with Purpose' roadmap that sought to reduce added sugars by 25 per cent on a per-serving basis, covering nearly two-thirds of the company's beverage portfolio. She also said thy'd reduce the sodium content in its food products significantly in the next few years. Mr Modi, it's time you reformed the IAS!